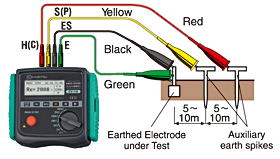 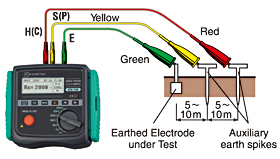 MeasurementAccording to the Wenner 4-pole method, apply AC current "I" between the "E" (earth electrode) and "H(C)" (current electrode) to find out the potential difference "V" between the two potential electrodes "S(P)" and "ES".To obtain the earth resistance "Rg (Ω)", devide the potential difference "V" by AC current "I"; where the distance between electrodes is "a" (m). 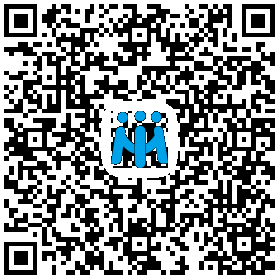 Then use the formula: ρ = 2 • π • a • Rg (Ω • m). 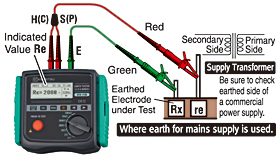 Principle of Earth Resistance MeasurementThis instrument makes earth resistance measurements with fall-of-potential method, which is a method to obtain earth resistance value "Rx" by applying AC constant current "I" between the measurement object "E" (earth electrode) and "H(C)" (current electrode), and finding out the potential difference "V" between "E" (earth electrode) and "S(P)" (potential electrode).